Kamehameha Schools, in collaboration with Keiki O Ka ‘Āina, hosts a yearly Board & Stone Class at the Community Learning Center at Mā‘ili. This family-based cultural experience teaches the Hawaiian tradition of hand-carving a papa ku‘i ‘ai (poi board) and a pōhaku ku‘i ‘ai (stone poi pounder) with natural materials gathered from the land. The class is taught by Kumu Ke‘ala Kwan, a Hawaiian culture specialist from Nānākuli who learned from Kumu Earl Kawa‘a. 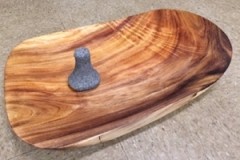 Kawa‘a coined the phrase “one board, one stone in every home,” and in 2010, Kawa‘a began teaching families how to make them. 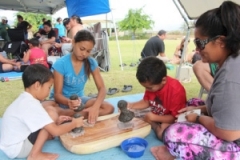 Since then, in conjunction with Keiki O Ka ‘Āina, the kumu has taught many Board & Stone classes in Waimanalo, Wai‘anae, Kalihi Valley, Papākolea, and Punalu‘u. The class is about so much more than just making a board and stone. It’s a way of bringing families together in a safe environment for learning and empowerment. It’s an opportunity for parents and children, aunties and uncles, brothers and sisters to share a culturally profound and meaningful experience. And, it’s a lot of fun! Writing their own oli, or protocol, that asks the land to share its bounty and provide them with the materials needed for the class. Using hau tree branches to make ko‘i, the adze used to carve their board. Choosing the raw slab of wood for their papa ku‘i ‘ai (poi board). Walking the kahakai for the stone they will transform into their pōhaku ku‘i ‘ai (poi pounder). Learning the different strokes and carving techniques. Lu‘ukai (purifying the papa ku‘i ‘ai in the ocean) and Pa‘akai (the importance of salt in culture, food and ceremony). A celebratory hō‘ike where families will name their board and stone, then use them to pound taro into pa‘i‘ai as part of a potluck lū‘au.